For several years, the Minnesota Legislature has been exploring the potential of increasing speed limits on existing rural highways that currently have 55 mph speed limits. Currently, state law sets statutory speed limits on all public roads. As recently as 2013, legislation has been introduced that would have changed the statutory speed limit in statute 169.14, Subd. 2(3) from 55 mph to 60 mph. This would have applied to all roads, including county roads, city streets, township roads, and any other roads that don’t fall into one of the other speed limit categories in statute 169.14 and don’t have a different speed limit that was set by the commissioner of the Department of Transportation as a result of a traffic engineering study. Ironically, the trunk highway system, which has been the primary focus of legislative interest relative to speed limits, is comprised entirely of sections that have speed limits authorized as a result of engineering studies and therefore would not be directly affected. Fortunately, MnDOT and local representatives have been able to make the case that a blanket increase in speed limit would not be safe. In 2013, as a result of legislative interest and after performing engineering studies, MnDOT increased the speed limits from 55 to 60 mph on some 700+ miles of two-lane, rural trunk highways, primarily in western Minnesota. Legislative interest in speed limits remained strong. 2014 Regular Session Laws, Chapter 312, Article 11, Section 36 was enacted, which required MnDOT to perform engineering and traffic investigations on trunk highway segments that are two-lane, two-way roadways with a posted speed limit of 55 miles per hour. Speed limits are expected to be increased on those roadway segments where studies find that the speed limit can be reasonably and safely increased. The statewide review must be completed by 2019, with approximately 20 percent of the roadway miles studied each year. This includes over 7,000 miles of trunk highway. Stonebrooke Engineering was selected to assist MnDOT in performing studies and writing select speed limit authorizations on more than 5,000 miles of trunk highway in five MnDOT districts. Data collection efforts began in mid-November, with 18 study segments selected for 2014. 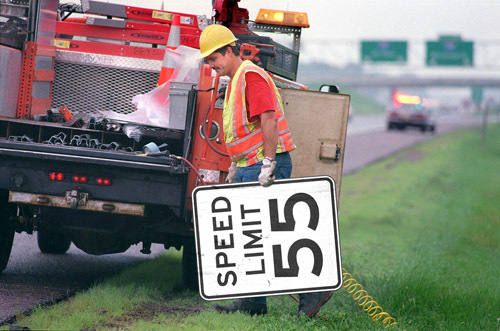 Including these studies and others performed by MnDOT personnel in three other MnDOT districts, about 340 miles of highways in northern and western Minnesota were authorized for 60 mph speed limits in early 2015. 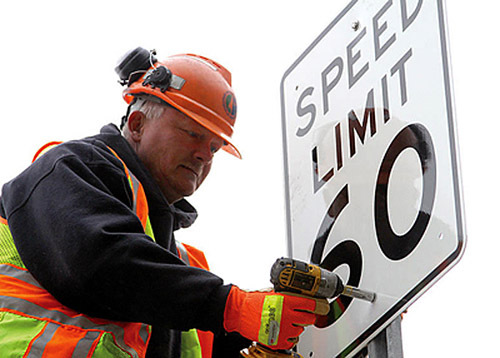 If the determination is that the highway can safely support a 60 mph speed limit, the final steps include writing speed limit authorizations and coordinating swapping out existing 55 mph speed limit signs with new 60 mph speed limit signs. Spot speed studies will be performed for each of more than 350 study segments. Spot speed studies measure point travel speeds of a representative sample of vehicles in the population. Speed studies will be performed using either pneumatic tubes or radar units. Tubes will be used for all segments with ADT values of less than 1,000 vehicles per day, while radar units will be used for segments with ADTs in excess of 1,000. The tube locations will include between 24 and 48 hours of data, including the following data elements for each vehicle: time stamp, travel speed, and vehicle classification. For the locations with greater than 1,000 ADT, manual speed samples will be collected with a radar unit. A minimum of 100 vehicles will be measured and classified as either a passenger vehicle or commercial truck. Field investigations are needed to assess the general environment of the roadway. These elements were chosen not because they necessarily have a direct or indirect impact on travel speed, but rather to provide a general snapshot of the environment of the study segment to the MnDOT District Traffic Engineer. Along with speed sample data and crash analysis, results of the field investigation will be considered in determining whether a roadway can safely support a 60 mph speed limit. Measurements are taken at a point location that is considered to be representative of the entire section. Travel Lanes and Shoulders. Travel lane and shoulder width, combined with pavement/gravel condition will be assessed. Travel lanes of at least 11 feet and usable shoulders of at least 5 feet are preferred. Rumble Strips. Shoulder and/or centerline rumble strips are preferred for those locations that potentially could receive increased speed limits. Access Density. Public street intersections, private driveways, and field entrances are counted and the total is divided by the length of the corridor. Numerous studies have shown that crash rates rise as access density increases. Average access density of no more than 10 accesses per mile is desired. Vertical Grades. It is preferred that corridors do not contain large numbers of vertical grades in excess of 3 percent. Roadside Assessment. Roadside environments with large concentrations of fixed objects or other hazards would not be conducive to increased speed limits. Inslope. Inslopes of 1v:4h or flatter are desired. Adjacent Development. No specific thresholds are set relative to adjacent development. This is a subjective data element intended to inform the district traffic engineer of the general environment of the corridor, such as rural residential, agricultural, plains, or forest. Speed Reductions. All regulatory and advisory speeds will be noted. Reductions in regulatory speed limits typically occur in areas near or in cities, or if the road environment otherwise changes significantly so that it no longer can safely support a 55 mph speed limit. Advisory speed reductions typically are associated with curve warning signs, but could be included as a supplemental plaque on any warning sign. Intersection Control. All traffic signals, roundabouts, and intersections with mainline stop control will be noted along the study segment, including those at the beginning and ending termini. Stonebrooke’s role is to perform speed studies and field investigations, analyze speed and crash data, and provide reports to MnDOT. The ultimate authority to determine whether 60 mph speed limits are appropriate remains with MnDOT. Analysis of crash data includes calculating overall crash rates and Fatal + “A” severity crash rates for the study segment and comparing to average and critical crash rates. A critical crash rate is a statistically adjusted crash rate to account for random nature of crashes. If segment’s crash rate exceeds the critical rate, it is not a good candidate for an increased speed limit without other structural improvements. Speed data from both tubes and radar will be analyzed. The primary calculations will include 85th percentile and 10 mph pace. “Good” speed samples are considered to be those that have the 85th percentile in the upper range of the 10 mph pace. The 85th percentile is the speed that is not exceeded by 85 percent of the population. This value is generally considered a good starting point for setting speed limits. The 10 mph pace is the 10 mph range of speeds that include the highest percentage of vehicles from the sample. When all the data collection, field investigations, and analysis are complete, Stonebrooke staff will assemble a report for each study segment. 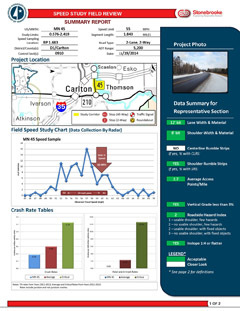 The reports are organized such that the front page provides an at-a-glance look at crash rates, speed sample results, and field investigation findings. Field investigation findings are reported with either green shading or no shading at all. Green shading indicates that the particular data element measured in the field likely would be conducive to an increased speed limit. No shading indicates that a deeper look into that particular data element may be warranted. The first page will provide the MnDOT district traffic engineer with a good indication of whether this corridor is a good candidate for a 60 mph speed limit – a high 85th percentile speed coupled with a low crash rate and lots of green shading would like be a good candidate. The second page provides a more detailed description of the study, and subsequent pages provide pictures and other additional information. If desired, MnDOT personnel can dig further into the raw data. When executed properly, rural trunk highway speed limit increases from 55 mph to 60 mph provide more efficient travel without compromising safety. This strong focus on safety is reflected in each study task, from field investigations through to final reporting. The structure and formatting of study components allows for these speed increases to be made in an informed, accurate, and responsible manner. As legislative interest in Minnesota speed limits continues, this type of study provides the necessary documentation to provide speed limit increases that are based on usable data and documented safety measures. And as with any speed limit change, drivers will need to continue to practice safe driving techniques and situational awareness.